E-mail general news tips, corrections, comments and questions. E-mail your submission. Anonymous letters will not be printed. Individual staff members can be contacted by clicking their byline or tagline anywhere on the site. 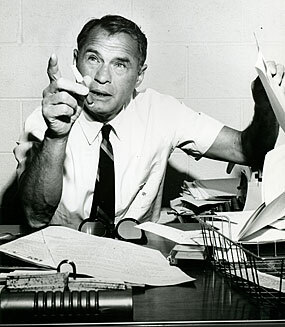 Hank Greenspun at his desk. Born of a movement to aid the little guy, the Las Vegas Sun has performed a vital role in the Las Vegas community for more than 60 years. Founding publisher Hank Greenspun died in 1989, but his legacy of intrepid and forthright journalism is embraced by Sun reporters and editors to this day. The Sun has continued its editorial excellence and community service into the 21st century, winning dozens of journalism awards over the decades while becoming one of the most honored local online news publications in the world. The Sun was the first media organization in the world to win the top awards in all three journalism areas: print, online and broadcast. In 2009, the Sun won the Pulitzer Prize for Public Service — journalism’s most prestigious award — for its investigation of construction deaths on the Las Vegas Strip and the failures of government, management and labor unions to protect workers. The Sun has also been recognized for having the best news website by Editor & Publisher in 2008, 2009 and 2010. In those same years the Sun also received the General Excellence Award from the Online News Association, and it continues to receive top honors for its online efforts. And the Sun was the first print-based news organization to win Columbia University's duPont Award, generally considered to be the most prestigious broadcast journalism award and its industry's equivalent of a Pulitzer Prize. These awards reflect the Sun's commitment to quality journalism and public service, while continuing to provide quality coverage of breaking news, business, entertainment and local sports, plus the state's best political analysis. The seeds of the Las Vegas Sun were planted in 1949 when the town’s only newspaper, the Review-Journal, locked out members of the printing union. As a result, the International Typographical Union began its own newspaper on May 3, 1950, but struggled financially. The ITU then turned to Hank Greenspun. With the aid of Nate Mack, a pioneer Las Vegas landowner and businessman, Greenspun acquired financial backing to make a down payment on the newspaper. On May 21, 1950, Greenspun published his first edition. In July of that year, the name was changed from the Las Vegas Free Press to the Las Vegas Sun. No person was too big or too mighty to be immune from criticism if he deserved censure by Sun editorial writers or the publisher. Throughout its history, the Sun has taken on the IRS, CIA, FBI and Howard Hughes. Perhaps the most infamous target was Sen. Joseph McCarthy. The Sun was the first newspaper in the nation to expose McCarthy as a power-mad, vindictive demagogue who used the threat of communism as an excuse for his witch-hunting crusades. As the Sun exposed local government and police corruption, its reputation for in-depth reporting grew, as did its influence in political matters. The newspaper also became involved in community projects originated and directed by staff members. After years as an afternoon newspaper, the print version of the Sun is now delivered across Southern Nevada with the Review-Journal. Because of this print arrangement, the perception could be that we are the same newspaper. Nothing could be further from the truth. The Sun continues to be locally owned by the Greenspun family. The business functions of the two newspapers are combined and operated under a Joint Operating Agreement, which is a U.S. Justice Department-approved method of maintaining competitive, distinct voices in newspaper markets. While the R-J handles the printing and distribution of the paper, the editorial material for the Sun is prepared in a newsroom with the Sun's Web operations and other Greenspun Media Group publications, independent of the R-J. The Sun's news staff and the news staff of the R-J compete and the two papers have very different editorial philosophies.